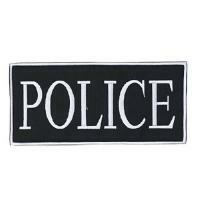 Identification patches from Voodoo Tactical make your role as a law enforcement officer immediately obvious. The bold white capital-lettered text contrasts against the black background, offering superior visibility and readability, even at long distances or in poor lighting/weather conditions. The patches can be attached to uniforms or tactical gear with compatible hook and loop mounting points. Utilize the sew-on loop section if garments are not fitted with a place to attach a department patch. A front patch measures two inches tall by four across; while the larger back patch is four inches high by nine wide. Police - Yellow,2" x 4"
Police - Yellow,9" x 4 1/8"
Police - White,2" x 4"
Police - White,9" x 4 1/8"
Sheriff - Olive,2" x 4"
Sheriff - Olive,9" x 4 1/8"
Sheriff - Yellow,2" x 4"
Sheriff - Yellow,9" x 4 1/8"
Sheriff - White,2" x 4"
Sheriff - White,9" x 4 1/8"
SWAT - Olive,2" x 4"
SWAT - Olive,9" x 4 1/8"
SWAT - Yellow,2" x 4"
SWAT - Yellow,9" x 4 1/8"
SWAT - White,2" x 4"
SWAT - White,9" x 4 1/8"
Police, White, 9" x 4 1/8"
Police, White, 2" x 4"
Sheriff, Olive, 9" x 4 1/8"
Sheriff - White, 9" x 4 1/8"
Police, Yellow, 9" x 4 1/8"
Sheriff - Olive, 2" x 4"
Police, Yellow, 2" x 4"
Sheriff - Yellow, 9" x 4 1/8"